Mozilla has closed a security hole in its Firefox browser that could expose information from secure websites to anyone gaining access to the software. 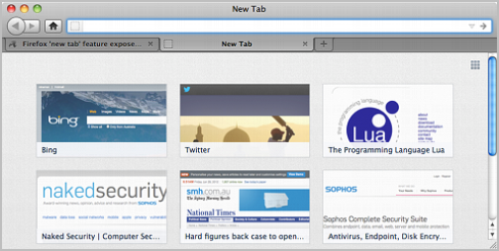 The flaw was found in the New Tab feature of Firefox 13. That feature displays thumbnails of previously visited websites whenever a new tab page is created. Those thumbnails could contain confidential information from banking and other secured websites. "The new tab feature that displays thumbnails of your favorite and recently visited sites in Firefox now omits privacy-sensitive websites like banking or webmail sites," Mozilla said in a statement to PCWorld. "The new tab thumbnails are based on your browsing history and you can easily control the experience by moving or deleting the thumbnails," it added. While Mozilla believes it has solved the New Tab problem, some security experts believe the root of the glitch may be difficult to address. That's because information from secure websites is routinely cached by browsers and has been for some time, according Sophos security expert Paul Ducklin. Anyone with access to Firefox, or its cache information, could browse that information for sensitive data, he explained. For example, everything in the cache of Firefox or Google Chrome can be displayed by typing in the address bar "about:cache" or "chrome://cache/." Although Mozilla has closed the New Tab loophole, it's still wise to set Firefox's history settings to clear its history when you close the software and to clear its recent history after performing tasks that involve submitting personal identifying information.